Many Of Our Customers Come To Us Asking About Tinting Their Front Windscreens. They Want To Know Whether It Is Legal To Do So, And What Exactly They Can Do. The Situation Is Complicated A Little More By The Fact That Glass Doesn’t Let Through 100% Of Visible Light In First Place. 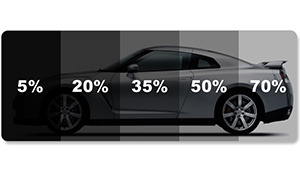 Clear Glass Lets Through Around 86% Of Light, And If You Have Slightly Tinted Windows Already Then You Could Already Be Approaching The 75% Limit. At Ultimate Tinting Brighton We Provide The Full Range Of Services To Homes In The Sussex Area, Including Tinting Conservatories, Patio Doors And Windows. Our Services Come With A Guarantee Of Quality That Gives Our Customers Peace Of Mind. Our Experience Enables Us To Get The Job Done Right First Time.The Legal Situation Is Complicated By The Fact That There Are Two Levels Of Law Depending On When Your Vehicle Was First Used. If It Was First Used Before April 1, 1985 Then Both The Front Windscreen And The Front Side Windows Must Let At Least 70% Of Sunlight Through. If The Vehicle Was First Used After This Date Then The Front Windscreen Has To Allow More Than 75% Of Light Through, And The Side Front Windows Must Let In 70%. There Is No Restriction On The Tinted Windows In The Back And On The Back Windscreen. We are experts when it comes to everything to do with tinting. We can do a light test of your windows and guide you on what is legally allowable. It may be the case that you can have a thin strip of tinting towards the top of your windscreen but it does depend on the vehicle. If you have a medical condition that requires specific front windscreen tints then we can help with that too. If you’re looking to tint primarily for security reasons then we can offer other solutions. For example, we can install clear film that creates an extra barrier against thieves, and is a visible deterrent to professional thieves who know what these films look like. There are a spate of manufacturers who produce precut window film for different vehicle models. We have access to just about every type of window film on the market, and can source for you at affordable prices. We can also cut film so that it fits your bespoke requirements. Our company has tinted front windscreens, back windscreens and side windows of thousands of vehicles in the past. We work with precision and use only the best quality products. Our tints tend to have a 10 year guarantee, so you have peace of mind that the job is being done properly. We are also flexible. We can tint on your lunch break, early in the morning, late at night or the weekend to get your windows tinted. We always strive to offer a convenient service because we understand you are busy. 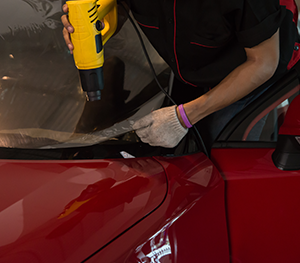 When we tint car windows we prefer to work in a controlled environment, offering you superior results. If you’re ready to get your windscreen and windows tinted get in touch by phone or through the online forms on this website. We can normally provide a quote over the phone, as well as some guidance, and have your windows done within a day or two of the initial call. The process itself only takes a few hours.